The most common problem building a coilgun is finding a high-power electrolytic capacitor. Pulse-rated caps are expensive and hard to find. 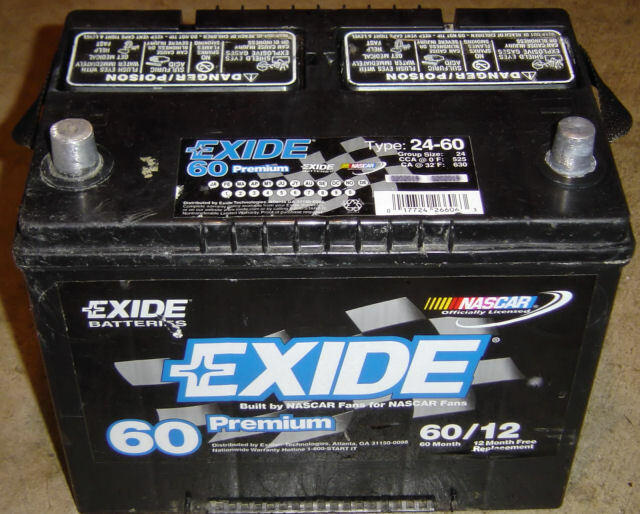 But ordinary car batteries are very common and store a huge amount of energy. And it just so happens that I have two used batteries available. First I must find out which one works the best. How do you test a battery? You need a load tester. 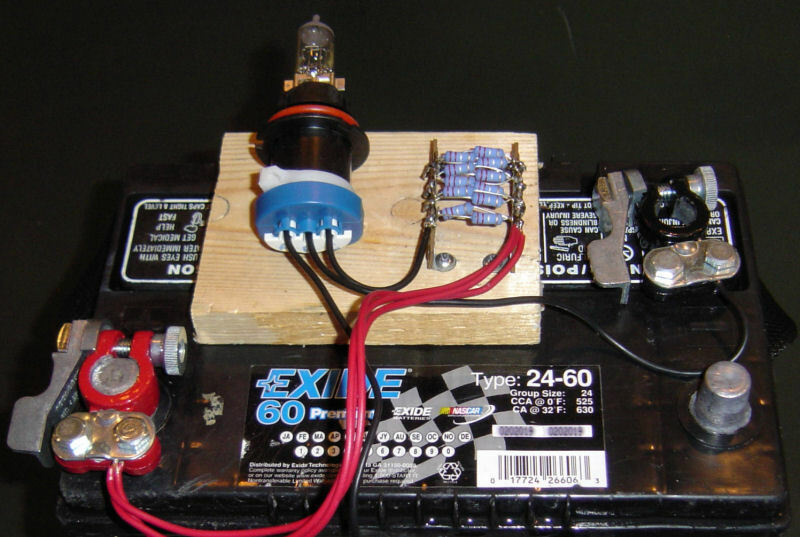 This web page describes a simple home-made load tester for testing relative battery performance. My "load tester" is simply an automotive headlamp bulb, in series with a low-value current-sensing resistor. This allows me to measure both current and voltage over time. The headlamp bulb is a replacement bulb for my Toyota Corolla, mounted in a standard high-temperature headlight socket. There is no on-off switch. Instead, I used quick-connect battery terminals. 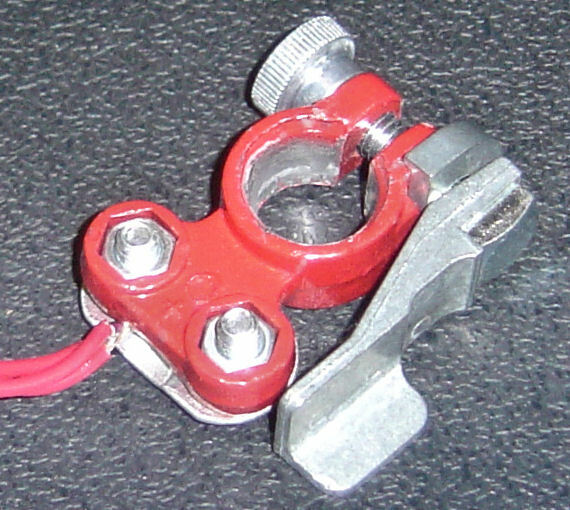 All connections are soldered for the lowest resistance. The Exide battery was surprisingly well behaved. In fact, it was annoying to have a brilliant headlight stabbing my eyes for over six hours. Then I went to bed for the night, and of course six hours later the battery measured less than one volt. It would have been interesting to see the discharge trajectory, but it's not quite interesting enough to run the test again. The "stair case" shape shows that lead-acid batteries are built from six 2-volt cells. As each cell failed, the voltage dropped by this amount. If I run this test again, I need a higher-current load. It took over six hours to get a significant decline from a relatively new battery. The 4-amp load in this test should be increased to 10- or 20-amps for quicker results. The current-sensing resistor is very useful. The load itself changed dramatically over time -- as with all incandescent loads, the resistance goes up as the bulb gets hotter. It was 3.1 ohms @ 12v, and 2.3 ohms @ 6v, and 1.6 ohms @ 3v, and finally 0.26 ohms at 0.1v. This light is so bright and long-lasting, it would make a great emergency light during power outages. It needs a reflector or shroud so it doesn't dazzle your eyes, but the total light output over time is amazing.